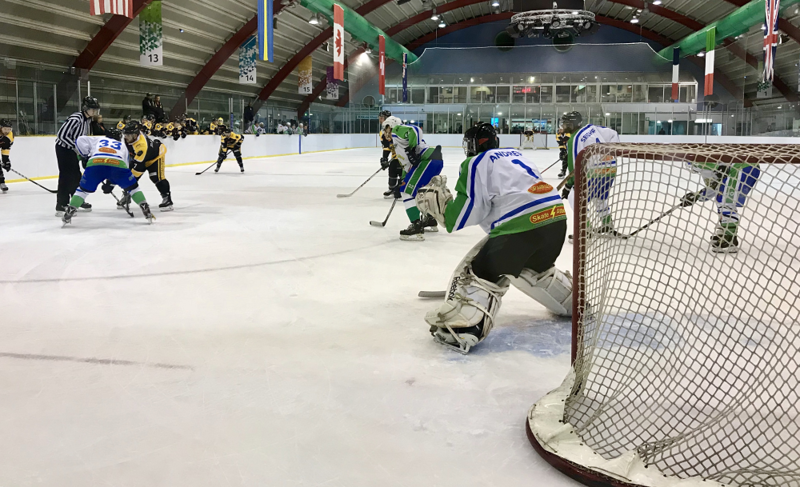 The Lee Valley Lions faced a stiff test on Sunday night, playing host to the Bracknell Hornets. The Hornets were flying high in fourth place in the standings, while the Lions were still searching for their first win of the season. The Lions were unable to call on the services of Joe Miller, Gus Zimmerman, Ben Gillingham, Jordan Sullivan, Joe Weare or Jack Ball for this game, but handed a debut to defenceman Jake Wadge. This gave them 13 skaters, with Steve Grout starting in goal and James Andrew backing up. The Hornets travelled to Lee Valley with 15 skaters plus netminders Will Sanderson and Rory Edwards. The Bracknell side featured many players who have previously played at a higher level, so looked sure to give the Lions a very tough game. First Period – The Lions unfortunately slipped back into an old habit of conceding a goal very early in the game, as the Hornets went 1-0 up after just 38 seconds; Daniel Clayton (0:38, assisted Josh Ealey-Newman and Ben Ealey-Newman) slotting past Grout after good build-up play from the Ealey-Newman brothers. Lions fans would have been forgiven for expecting an onslaught to follow, but instead in the next few minutes of the game the home side were able to stabilise themselves and create a few chances of their own which Sanderson in the Hornets net could turn away. At the other end. Bracknell captain Jack Tarczycki then hit the pipes twice in quick succession with hard slapshots as the Hornets started to exert their authority on the game. However the Lions were able to tie the score up just after the five minute mark, Michael Jacobs (5:14, assisted Nicky Brathwaite) getting his second goal in as many games after scoring his first of the season last week in Cardiff. For the next five minutes following the opening goal, the Lions gave a good account of themselves and kept the score at 1-1, until the Hornets went back into the lead just past the 10 minute mark; Steve Fisher (10:19, assisted Harvey Hind-Pitcher) putting them back in front. Worse was to follow for the Lions shortly after as starting netminder Steve Grout took a puck to the helmet and had to leave the ice, to be replaced by James Andrew. And shortly after Andrew had come into the net, the Hornets extended their lead to 3-1 through J. Ealey-Newman (13:25, assisted B. Ealey-Newman and Connor Hutchison) with Lions forward Nicky Brathwaite in the box for tripping. A flurry of Hornets goals then followed to extend the score to 6-1, with B. Ealey-Newman (14:12, assisted J. Ealey-Newman and Matt Jordan), J. Ealey-Newman (16:21, assisted Conor Sheehan) and Liam Rasmussen (19:34, assisted Fisher and Tarczycki) all doing the damage. However there was still time in the period for the Lions to get one back, Czech forward Tom Hnilica (19:51, assisted Ollie Glover and Michael Jacobs) sniping past Sanderson for his fourth goal of the season to get the score back to 6-2 at the end of period one. Second Period – The Hornets swapped netminders to begin the second period, with 16-year-old Rory Edwards replacing Sanderson between the pipes. And he was called into action in the first few minutes of the period as the Lions looked to get back in the game, stopping chances from Nicky Brathwaite and Simon Jones to keep the Lions at bay. The Hornets then effectively put the game to bed in the 27th minute with a spell of three goals within 35 seconds; Jakub Fojtik (26:12, assisted Hutchison and Luke Jackson), Fojtik again (26:35, assisted William Stead) and Fisher (26:47, assisted Rasmussen and Jordan) increasing the score to 9-2. The Hornets then could have extended the lead even further – James O’Brien brought down a Bracknell forward on the breakaway and a penalty shot was awarded – but James Andrew denied Steve Fisher on the subsequent penalty shot. However the Hornets did grab the tenth goal just after the half hour mark, Fojtik (30:03, assisted Hind-Pitcher and Stead) completing his hat-trick, before Rasmussen (31:47, assisted Fisher and Cameron Barker) made it 11-2 soon afterwards. The Lions tried to create some chances, with Jacobs coming close to his second of the game but being denied by Edwards, before the Hornets rounded out the scoring for the second period as B. Ealey-Newman (38:44, unassisted) made it 12-2. Third Period – The final period of the game was really a question of whether the Hornets would dial it back against their tiring opponents – but this question was answered with an emphatic “no” just 56 seconds into the period as J. Ealey-Newman (40:56, assisted Fojtik) made it an unlucky 13 for the Lions and completed his hat-trick too. The Lions still pressured the away side, looking to score a few goals and get some pride back in the game – Joe Berry went close on two separate occasions but both times he was denied by Edwards in the Hornets net. However as the period went on, the Lions got more and more tired, while the Hornets showed all of their skill and speed on the puck as they punished their opponents with a flurry of goals. B. Ealey-Newman, Clayton (x2), Fojtik, J. Ealey-Newman, Stead and Tarczycki all netted between the 46th and 57th minutes to push the score up to 20-2, with almost every Hornets attack seemingly leading to a goal as they turned on the style. Despite the hugely one-sided scoreline, the Lions still tried their best to at least get a goal or two back; Tom Hnilica came closest with an accurate shot but Edwards in the Hornets net stood firm once again. The away side completed their scoring in the final minute of the game as Tomas Gilheany (59:03, assisted Fisher) made it 21-2; but there was still time for the Lions to give their fans something to cheer as Yasin Sridhar – usually a defenceman but deployed as a forward in this game – grabbed his first goal for the Lions (59:59, assisted Glover and Brathwaite) with a buzzer-beater right at the end of the game. Michael Jacobs took home the Man of the Match award for the Lions after being involved in all three goals (he picked up one goal and two assists), while the Hornets’ 16-year-old netminder Rory Edwards took home the award for the visitors having only been beaten right at the end of the game. A night to forget for a Lions side that is still finding chemistry and adding new players to the roster, as they were outclassed by a Hornets side that showed why they are eleven places above the Lions in the league. The Lions will now regroup and look to take something from next weekend’s two away games in Haringey and Romford. The Lee Valley Lions play two away games this upcoming weekend: on Saturday 10th November we visit Alexandra Palace to face Haringey, while on Sunday we travel to the Sapphire in Romford to take on the NIHL2 Raiders. Faceoff for both games will be 17:30.